Normally I don’t associate vinegar with dessert and it’s for this reason that the following recipe grabbed my attention. From another era when you worked with what was locally available and utilized everything. I came across this reference to Vinegar Pie in a book I’m reading which spans the mid-1800’s to depression era in Vermont. I did some digging and reworked a recipe I found online to include maple sugar. Why Vinegar?? Because you’re back in the late 1800’s, you’re a pioneer with no access to fresh fruit, you’re resourceful and you’ve exhausted your supply of apples, save a little vinegar in the bottom of the barrel. I could probably add some other fancy words to this humble title, but I want you all to be intrigued by its name enough to give it a try. Mix flour with ½ cup sugar. Add the water gradually and cook on top of a double boiler for 15 minutes, stirring constantly, or until thickened. Add butter, maple syrup and vinegar. Mix well and remove from heat. Place of piece of waxed paper on top of the custard. Meanwhile, beat the egg whites until foamy and gradually add the 3 tablespoons of sugar. Beat until a stiff, flossy peak is achieved. Remove wax paper and pour custard filling into the prebaked shell. Top w/meringue. Place in oven and bake until meringue is nice and brown, about 15 minutes. Here’s a recipe I found online for a delicious, bold take on asparagus. It’s hearty enough for a light dinner and the crisp, sweet caramelized scallions are delicious paired with the asparagus. Bon appétit. Bring a small pot of heavily salted water to a boil, stir in farro, cover, and simmer until al dente, 20 to 30 minutes. Meanwhile, in a large bowl, whisk together 2 teaspoons soy sauce, lime juice, garlic, and pinch salt and pepper. Drizzle in 3 tablespoons oil, whisking constantly. Drain farro and stir immediately into dressing while still warm. Heat oven to 425 degrees. Spread asparagus and scallions over a rimmed baking sheet and drizzle liberally with oil, 1/2 teaspoon soy sauce and a pinch of salt and pepper. Toss to combine, then arrange in a single layer. Roast until they start to char in spots, about 20 minutes. Let cool slightly: The asparagus are best while still a little warm but not hot enough to wilt the greens. I recently read an article whose byline was “Let’s all stop pretending we love Kale.” Agreed, so let’s eat Chard instead. A vibrant dressing makes these humble leaves go Ka-Pow. Jolt your taste buds like the Nebraska Knoll crew jolts the boiling sap when it’s about to froth out of the back pan: The moment someone flicks a dab of butter onto it to subdue the froth, it roars back, Ka-Pow. Now for the stats: Heartier than spinach but more tender than kale, one cup of raw Swiss Chard contains more than 300 percent of your recommended intake of vitamin K. Ka – Pow again! Simple, easy and oh-so-delicious when we’re all craving freshness. Wash 1 bunch Swiss Chard; pat dry. Discard stalks and slice leaves into thin ribbons. Mix greens with dressing and top w/sliced avocado and sesame seed or cashews. Whisk egg white in a small bowl until frothy. Stir into granola mixture, distributing it throughout. Spread it in a single layer on a parchment-lined baking sheet. Bake for 45-50 minutes. About halfway through the baking time, use a large spatula to turn over sections of the granola, carefully breaking them up as little as possible. 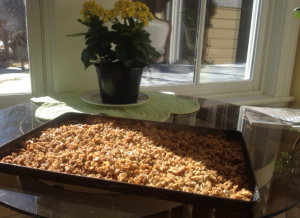 Rotate pan if granola is baking unevenly. When evenly browned and feels dry to touch, transfer the pan from the oven to cooling rack. Cool completely. Sprinkle on dried fruit. Keeps at room temp. in airtight container for 2 weeks, or freezer for even longer if you’re a stockpiler. They’re kind of like fruit pancakes. No batter here, just ruby red grapefruit rounds, served with maple syrup spiked with a little grated ginger….soooo good. Step 1: Cut away ends of each grapefruit. Stand on a flat end, and remove the skin and pith by cutting down the sides of the fruit. Slice each grapefruit horizontally into 4 or 5 thick rounds. Step 2: Grate fresh ginger and mix with maple syrup. Alternately, you can buy a ginger juice, that works too. Heat both together. Step 3: Heat butter over medium high heat and sear grapefruit slices for no more than 20 seconds on each side and remove to a plate. Drizzle with ginger maple syrup, garnish with pomegranate seeds or dried cranberries and serve at once while grapefruit is still warm. To get to Nebraska Knoll you follow the road that crosses Miller Brook and swoops sharply right into Nebraska Valley. The first house you pass is Joe and Becky’s on the left. Look to see if their sheep have lambed. You may glimpse a chicken or rabbit in the yard. Notice the skis lined up on the porch, a syrup pan set up in the garage with the smoke stack poking outside. They tap the maples across the road by Miller Brook. Remember the days of maple walnut combo… in ice cream, particularly? Well this recipe was adapted by someone who missed that good old New England flavor combination and decided to recreate those special flavors unique to our area. Pastry crust is fine but this unusual shell is more than just a holding pen for its filling. Think of the possibilities with strawberry season fast approaching. Preheat oven to 350 degrees. Butter the bottom and sides of a rectangular tart pan. A large round one will work too. But regardless of its shape, it’s best to use a removable bottomed pan. Combine white and maple sugars in a small bowl. Put the egg whites and salt in a large mixing bowl and beat together at high speed until you get soft peaks. Keep whipping them as you slowly add the sugar, two tablespoons at a time, until the cup of sugar is fully incorporated into egg and you’ve got glossy peaks. Slowly mix in two tablespoons of maple syrup. Fold in the chopped walnuts, crusted soda crackers and baking powder. Spread the mixture into the prepared tart pan, taking care to make the sides high, so that there is good indentation the middle to hold the maple whipped cream for service. Bake the shell 25-35 minutes or until the meringue is golden but not brown. Remove from the oven and cool completely. Refrigerate the shell at least two hours (preferable overnight if you’ve got the time). Meanwhile put ¼ cup maple syrup in a non-stick skillet and add the walnut halves, coating them with syrup. Heat up the mixture on medium letting the syrup bubble up around the nuts. When the syrup is caramelized and very sticky and the nuts are coated, they are sufficiently candied. Lift the nuts out of the pan one at a time and let them cool separately on lightly buttered parchment. Store in airtight container, until ready to use. When you are ready to serve the tart, whip the cream to soft peaks. Add 4 tablespoons of maple syrup and whip the cream a bit more. Spread the cream in the meringue cavity. Top with candied walnuts and serve. This does keep well in the fridge for several hours. “Swiss Chard” No, it doesn’t taste like chocolate or keep great time. It gets the name Swiss Chard (a.k.a Green Chard) because of its extensive cultivation in Switzerland. The botanist who discovered and then named it hailed from Switzerland. However, its origin is farther south, in the Mediterranean region, specifically Sicily. So now that you’ve had a little background…Welcome Spring and with that a quick and easy way to prepare Swiss Chard. The maple syrup and sherry vinegar add a sweet spark to this dish. Remove center ribs from chard with a sharp knife. Cut the ribs into ½ inch pieces and set aside. Coarsely chop the chard leaves and set aside. Using a large heavy-bottomed skillet, heat oil. Add onion, paprika and chard rib pieces. Cook over medium for 5 minutes. Add raisins and stock, cover and cook over medium-low heat for 5 minutes, stirring once or twice. Combine maple syrup and sherry vinegar and toss with chard. Top with cashews and serve. I recommend placing a thin slice of your favorite VT cheese …hard, sharp cheddar or soft creamy, tart Brie, onto the most delectable of crackers. The combination of crunch, slight maple sweetness and ever-so-tart cheese will do for to your taste buds what above freezing temperatures and sunshine are doing to the sugar maples this spring. Enjoy two local, unique products whose flavor should invoke your own personal images of the beautiful place we call home. Spread the Joy! In a food processor, combine both flours with ¼ cup maple sugar and salt. Pulse to mix, Scatter cold butter on top and pulse until a coarse meal forms. Add water and ¼ cup of maple syrup and pulse until the dough comes together when you pinch it. Scrape out onto a work surface and press together. Divide dough into 4 equal pieces and shape into disks; wrap in plastic and chill for an hour or longer. Preheat oven 400 and line 2 baking sheets with parchment paper. On a floured work surface, dust 1 disk of dough with flour. Roll out dough into a 12-inch round and transfer to prepared baking sheet. Repeat. Brush with syrup and sprinkle with maple sugar and a bit of coarse sea salt. Second time around I added a sprinkling of dried rosemary onto before baking for a more savory flavor. Bake for 18 minutes, until crisp; shift the sheets from top to bottom and front to back halfway through. Transfer to racks and cool completely. Repeat with remaining dough. Break into shards. A second chance for the oh-so-sweet, sweet potato…no marshmallows with these; just our good old friend, maple syrup. A nice balance of sweet and spicy (there’s that combination again) but not overly sweet, plus the Greek yogurt makes a rich counterpart. These cakes will scorch when you’re not watching…so look alive and practice your wrist flipping skills. Just in time for Passover/Easter …wow the elders with these faux latkes. Saute onion in a bit of oil on med-low for about 10 min. Make cakes by placing shredded potato in a large bowl and toss w/salt, letting it stand for 5 min. Serve while crisp with Curried Greek Yogurt. To date I’ve focused mostly on maple-infused desserts, perhaps leading to the false impression that this is the only suitable use of the spring nectar. Maple syrup is an ideal replacement for all other lesser classes of sweeteners (sugar, karo syrup, molasses, etc), not only addressing the sweet piece of our pallet but also imparting it’s own unique and subtle woodsy/smoky flavor. Following is a recipe utilizing spring’s bounty. Enjoy and explore maple’s possibilities throughout your culinary repertoire. East meets West in this wonderful salad which encompasses all of the crowd pleasing elements: crisp, crunchy, sweet and sour. 1. Finely shred cabbage and combine with minced scallions; cover and refrigerate. 2. Preheat oven to 350. Melt butter and oil and toss w/ramen, sesame seeds and almonds. Spoon onto a baking sheet and bake for 10-15 minutes, shaking often to make sure they don’t burn. When brown remove from oven and cool. 3. Combine dressing ingredients and shake. 4. Combine salad, crunch and dressing immediately before serving. It is a heavily dressed salad, so be cautious and use a bit at a time to your liking. Toss when ready to eat otherwise it looses it’s crunch. A moist, delicious tea cake, perfect for Easter and…… it’s wheat and gluten free! If I close my eyes and take a bite I’m transported to a breezy, warm beach. I can almost hear the soft lapping sound of the surf retreating back to the blue sea. It must be the coconut flour, the taste and smell bringing back memories of a “Black Cake” discovered completely by accident in a little shop on the side of the road on the island of Virgin Gorda. With the addition of Vermont golden maple sugar this concoction is destined to create fond memories. Cream together butter and sugar until smooth. Add in eggs, one at a time and beat until fully blended. Add milk and vanilla and mix until combined. Combine flours, coconut, salt and baking powder and add to the wet mixture. Spread into greased cake pan (9×13) or small bundt pan and bake at 350 for 30 minutes or until a tester comes out clean. Serve plain with toasted, shredded coconut; or make a maple glaze (confectionary sugar and maple syrup until you reach the consistency of frosting; ) I tried the glaze for this post, but I would opt to leave it plain next time, as the flavor stands alone subperbly. French Toast gets a makeover. What to do with stale bread? You take that stale, old bread (preferably Challah or Brioche), soak it in a simple syrup made with, well you guessed it, maple syrup, as well as other ingredients listed below, top it with frangipane – sweetened, buttery almond paste – and bake it until the syrup forms a crisp, lightly carmelized sheen. It’s moist and rich inside, like bread pudding you can hold, but only so much better because anything made with maple syrup and topped with frangipane has got to be this good. To my mind, it’s the ultimate french toast replacement — no more batter and soggy bread; no more burning slices.. as you try and feed a table full of starving breakfasters. My reaction after sampling for the first time was to question whether Bostock is in fact a breakfast food. Something this delicious will definitely give your taste buds a jump start in the morning. Dessert for breakfast anyone? Cream butter and sugar, beat in the egg, almonds, extract, amaretto and flour… that’s it! 4. Dunk slices of bread in warm syrup and squeeze out like a sponge. Place two inches apart on your pan. Bread really needs to be stale or it will turn to mush right about now. 6. Sprinkle slivered almonds on top and bake for about 15-20 minutes, just enough to set the frangipane. Some two thousand plus years ago during Hippocrates’s time, a medicinal drink called Oxymel originated. It was the Greek’s version of an electrolyte-boosting beverage containing apple cider vinegar, honey and water. Fast forward to agrarian 19th century New England where making hay was a life sustaining necessity. Cutting, raking, drying and stacking hay all day made a hike to the summit of Mount Mansfield seem like a leisurely stroll. Continuous, hot, sweaty, work (or play) requires a person to be energized from dawn to dusk. Switchel or Haymaker’s punch was born via common household ingredients; necessity is the mother of invention after all. As you’ll see, all of the ingredients are dietary sources of potassium, an essential mineral important in the transmission of nerve impulses, building muscle tissue, beating of your heart and metabolizing carbohydrates and proteins. And you thought you were reading about the making of maple syrup. If you can make it with sap, all the better, if not, water will do fine. Make a batch, leave in your frig and use instead of gatorade or vitamin water. Bring all of above ingredients to a boil and stir until dissolved; remove from stove and store in refrigerator. Whet your whistle, as often as you like. Confused about the difference between a turnip and a rutabaga? So was I. Some quick Google research revealed that turnips are a Paleolithic food, cultivated around the world and revered by the Romans. Rutabagas are an 18th century result of crossing turnips with cabbages. Which got me thinking… maple syrup is a Neolithic, North American product. Like the transformation of sap to syrup the following recipe morphs common ingredients into an unexpectedly delicious dish, one which combines the earthy, nutty flavors and creamy, fibrous textures of turnips and rutabagas, with a healthy dose of Maple Syrup. Maple Syrup binds all the ingredients while adding a unique, smoky, woodsy flavor, thus eliminating the bitterness often associated with turnips and rutabagas. Peel turnips and rutabagas and slice as thin as possible, using a mandoline if you’ve got one. Toss in a bowl with salt and pepper, celery seed and thyme. Combine half and half, maple syrup, cayenne and nutmeg and heat over medium flame. Bring to a boil then remove from heat. Arrange 1/3 turnips and rutabagas in bottom of greased skillet. Pour 1/3 cream mixture over veges and sprinkle w/cheese, dot with butter; then add another 1/3 turnip/rutabagas, repeating above steps until you’ve used up all your vegetables. Don’t overfill the dish; the cream mixture should stop just below the top so it doesn’t bubble over in the oven… you may have a bit left over. Cover with foil and cook for 1/2 hour. Uncover and cook an additional 45 minutes or until the top is brown and liquid is absorbed. Here’s an ordinary and traditional treat, familiar to many and elevated to the extraordinary, with the addition of Nebraska Knoll Maple Syrup and Maple Sugar. Now that you’ve created these delectable morsels, what to do with them? Here are just a few possibilities: toss in your lumberjack’s lunch bucket, place on a doily at your next afternoon tea, bring to Town Meet’n………you’ll think of something! Regardless of the manner of presentation this will put smiles on faces. Sweet, buttery, slightly salty, flaky cookie with the wonderful essence of maple crowned with or without a maple cream cheese glaze……yes, this cookie will take you to the next level. Preheat oven to 300 degrees. Lightly butter a 9″ spring form tart pan with removable sides. Combine butter, salt and sugar in the bowl of an electric mixer. Beat til fluffy. Add the maple syrup and combine completely. Add flour a little at a time until just combined. Press into a 9″ spring form tart pan. Refrigerate for an hour or up to overnight. Sprinkle w/ 3 teaspoons maple sugar. With a very sharp knife, slice the dough into 16 wedges and pierce the top of the wedges with a fork’s tines. Bake for about an hour or until it is barely golden on the edges. Cool and remove the outer ring of pan. Re-slice the cookies along the same lines with a sharp knife. Remove from pan. As they cool they will crisp up. To Frost or Not to Frost. Well, I happened to have some left0ver maple cream cheese frosting in the frig from last week’s project, so I thought I’d slather some on the shortbread and the result was kind of like shortbread gone to finishing school, not necessary but well worth the small amount of effort. Cream butter and cream cheese til smooth. Add powdered sugar, syrup, vanilla and milk. Time to put another log on the fire. Until next week……. “CHIA” means strength in the Aztec and Mayan cultures, and folklore has it that these cultures used the tiny black and white chia seeds an an energy-booster. Makes sense because they contain healthy omega-3 fatty acids, protein, fiber, antioxidants and calcium. ”Syrup” in Vermont culture means a sweet delicious concoction made from sap of the noble maple tree. Combine syrup and chia and you’re sure to have the strength to get up in the morning and do what needs to be done! Sugaring is not for the weak, so we’ve pared the benefits of chia seeds with not only fruits, but also the fruits of labor from sugaring to make a delicious spring jam that is sure to please. It’s simple, delicious and oh-so-good. In a medium saucepan, combine berries and syrup. Bring to a simmer over medium-high heat, stirring frequently. Reduce to medium low and simmer for 5 minutes. Lightly mash berries w/a fork, leaving some whole for texture. Stir in chia seeds until thoroughly combined and cook until mixture thickens, about 15minutes. Once the jam is thick, remove from heat and stir in vanilla. Enjoy on toast, muffins, oatmeal, smoothies, crepe filling, by-the-spoonful and more…. These are crazy-good served in a green salad w/ dried fruit. Perfectly glazed, sweetened with maple and finished w/ sea salt. I’ll admit, balsamic vinegar? But that one ingredient paired with maple and sea salt is what makes these so tantalizingly delicious and brings the individual ingredients to life, flavoring your taste buds with the first hint of spring. minutes in oven, being careful not to burn them. and toss into your favorite green salad. “Everything tastes better with a little bit of bacon.” Serving bacon, coated with pure maple syrup and baked until crisp,, completes just about anything you put it on. A maple-bacon BLT…come on, it’s amazing; or crunch up a few slices and serve atop your oatmeal, just like Gramma Wiltz used to make. With just two ingredients, it’s ooh-so-easy and oh-so-delicious. Heard a comedian recently comment on the wonders of bacon…it went something like this: :”When you’re frying it up it sounds like applause….”yeah bacon.” Here’s to a perfect combination. Preheat oven to 400 degreesPlace baking rack on a sheet pan and arrange the bacon in one layer on the baking rack. Bake for 15-20 minutes, or until the bacon begins to brown. Remove the pan carefully from the oven; there will be hot grease in the pan! Brush the bacon slices with Pure Maple Syrup and bake for another 3-5 minutes, flip over w/ tongs and lather up the other side for another 3-5 minutes or until the bacon is warm golden brown…Longer if you like crispier bacon. Transfer to a plate w/ paper towel and serve. —MTL. Recipe courtesy of Ina Garten. Toss nuts in a large bowl with olive oil, salt, pepper, rosemary and maple syrup to coat evenly. Add more or less syrup and/or salt according to your taste. Divide it among 2 roasting pans and Bake at 325 for 15-20minutes, or until the nuts begin to brown. Remove from oven and sprinkle with Nebraska Knoll Maple Sugar and let cool. Store in airtight containers. Blogger’s Note: If you want these to last more than a day, store them in airtight containers and hide them behind the piano. The maple sugar in this recipe goes by the name ‘Maple Snow’ up at the sugarhouse. It really does resemble snow, too, with its fine light crystals. Combine first three ingredients and beat until soft foamy peaks form. Gradually add Nebraska Knoll Maple Snow and beat until stiff and glossy. Sprinkle with 1 Tablespoon of Nebraska Knoll Maple Snow. Bake for 1 ½ hours. Turn off heat and leave in oven with the door closed for an additional 1 ½ hours. They are crunchy on the outside, chewy on the inside, and melt in your mouth like sugar-on-snow. 1. Preheat oven to 475. Lightly grease an 8 inch square or 9 inch round pan. 2. Chop cooked bacon into ½ inch pieces and combine with remaining topping ingredients and spread into prepared pan. 3. Combine dry ingredients in a bowl. Work in cold butter until crumbly. Add buttermilk, stirring lightly to make a sticky dough. 4. Drop dough in heaping tablespoonfuls over topping in pan. 5. Bake for 10 minutes. Turn oven off and leave for an additional 5-10 minutes until golden brown. 6. Remove from oven and immediately turn pan over onto a serving plate. Scrape any topping left in pan onto biscuits. 7. Serve in a pool of warm maple Nebraska Knoll syrup. Serendipity is often the prime ingredient to successful sugar making. With the right combination of evening and daytime temperatures, wind from the west and other unknown natural phenomena, the sap flows bountifully. Serendipity came to play this morning as I read the blog entry for March 1st. The tree branches were described as: “….each sports a white chef’s hat as light as meringue…” I had been thinking all week about making this week’s entry of Maple Meringues and there it was, serendipity at work.